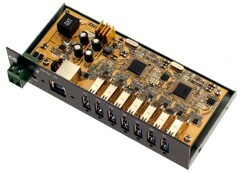 The USB3-16U1 16-Port USB 3.0 Metal Hub with Surge Protection features 16 Type-A downstream port connectors on this hub for USB 3.0, USB 2.0, USB 1.1 devices. All ports support standard and screw-lock type USB cables. The 2-Pin self power input connector uses 1 pin for positive voltage and the other pin for a GND connection. The terminal block connector is used to connect strong power in order to self-power the hub. The voltage can be in the range from +12V to 24V DC. There are 2 Type-B upstream connectors that offer a selectable rocker switch. Either Port A or Port B can be used to control the downstream ports on the device. Both ports can be connected to a host or another USB 3.0 Hub. These connectors support standard and screw-lock type USB cables.